Made famous by his role as Murray in the cult hit Flight of the Conchords, and also by his role as Norman alongside Jim Carrey in the Hollywood blockbuster Yes Man, Rhys Darby has fast become a household name. However, the journey hasn’t been all sunshine and rainbows for the New Zealand born comic, as he reveals in his new book This Way to Spaceship. Self-described as ‘a handy autobiographical end-of-the-world companion’, This Way to Spaceship seems ultimately a good excuse for the telling of Darby’s favourite childhood anecdotes - not that we’re complaining. The main theme of his latest work being how to make it onto the VIP spaceship the ‘government’ (which government we are not informed of…it’s THAT secret) is most obviously working on in case of the predicted Armageddon of 2012. Though this thread is quite haphazardly intertwined throughout the book, Darby kindly guides us on how to ‘make it’ and subsequently be invited aboard one of these lifesaving arks. This Way to Spaceship follows the life of the endearing comic, from his days as a wee tot, right through to his beginnings with fellow New Zealand comedy duo, Flight of the Conchords and beyond. With carefully thought out sections dedicated to thoroughly underlining the importance of getting noticed, leadership, popularity and confidence, in order to successfully gain the ever important VIP status, Darby explains through his various experiences how these four spheres hold the key to acquiring the much desired safe passage. Darby’s effortless humour translates perfectly to the written word, as he maintains his quirky and original, sometimes socially inept, banter. Sharing ‘life skills’ that only a man of his position could get away with (his suggestion of using birthdays to an unending advantage is quite hilarious), Darby continues to dazzle, amuse and enlighten (whether for the good is debatable). With an amusing brief cameo by his wife Rosie, we are invited to a sneak preview of the similarities and differences between his character Murray and the man himself. While a little aimless at times, Darby’s anecdotes and humour manage to curb any sense of boredom - to quote “If you’re going to read one book before the world ends…grab this one as well!”. 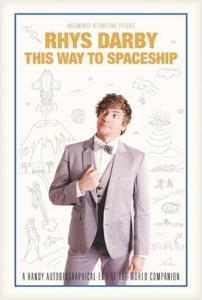 This Way to Spaceship is a comical amalgamation of all that is Rhys Darby.